Struck by China’s legendary Shenzhen Guobao Mint exclusively for the 48th Annual Berlin World Money Fair held February 1-3, these 50-gram silver medals were the toast of the show. 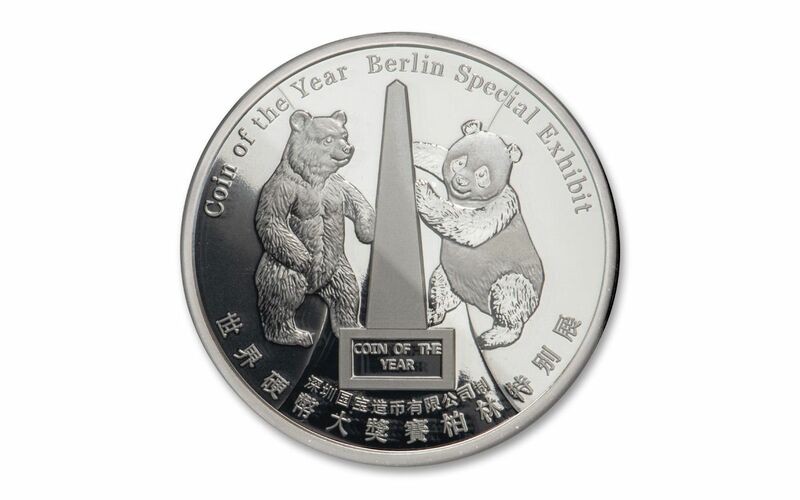 The one-year-only design shows a Berlin Bear and a Chinese Panda Bear next to the Coin of the Year trophy on the reverse and the Berlin Bode Museum and the World Money Fair logo on the obverse. Just 300 of these fabulous 99.9% fine silver medals were issued making them among the scarcest Pandas in existence! Each 2019 China Berlin Money Fair Panda 50-gram Silver Proof has been certified and graded by the Numismatic Guaranty Corporation (NGC) as being in flawless Proof-70 (PF70) condition, a distinction that means your perfectly-graded proof will have ZERO imperfections – showing all features and fields exactly as the engraver and mint intended. In addition, NGC has graded your Panda to be a First Day of Issue (FDI) coin, meaning it was received by NGC or an NGC-approved depository by the release date or on the business day within 24 hours of the official release date. Each medal is individually serial-numbered on the reverse and will come with its original government packaging and mint-issued certificate of authenticity. 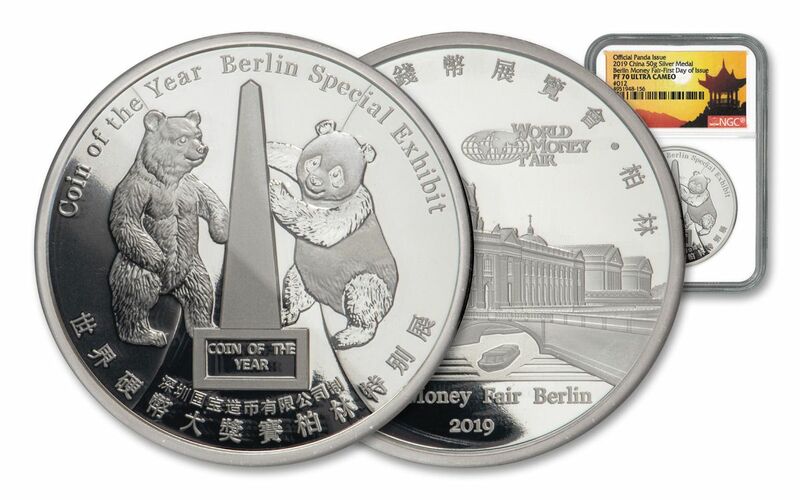 STRUCK IN HIGHLY-PURE SILVER – These 2019 China Berlin Money Fair Panda Silver Medals were struck in fifty grams of highly-pure 99.9% silver. 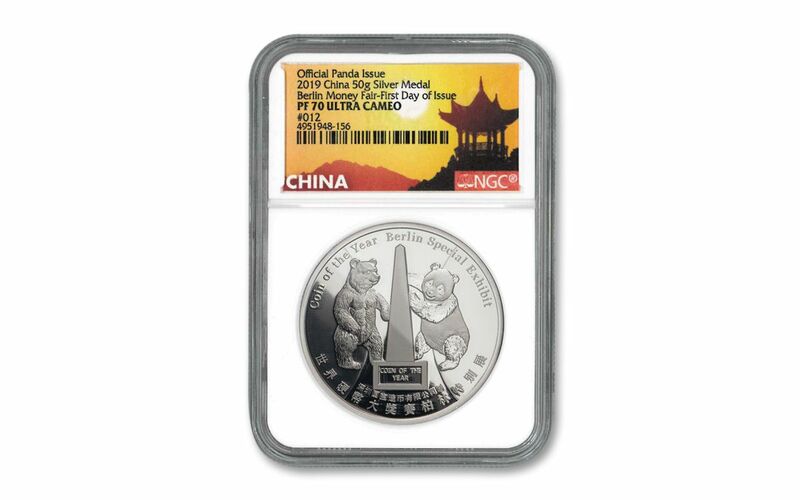 GRADED IN PERFECT PROOF CONDITION – Your 2019 China Berlin Money Fair Panda 50-Gram Silver Medal has been certified and graded by the Numismatic Guaranty Corporation (NGC) as being in flawless Proof-70 (PF70) condition, a distinction that means your perfectly-graded proof will have ZERO imperfections – showing all features and fields exactly as the engraver and mint intended. LOW LIMITED EDITION – The China’s Shenzhen Guobao Mint struck only 300 of these exclusive 2019 China Berlin Money Fair Panda 50-Gram Silver Proofs. Each medal is also individually serial-numbered on the reverse and will come with its original government packaging and a match-numbered mint-issued certificate of authenticity. With a limited edition of just 300 – and available exclusively at the 48th Annual Berlin World Money Fair Show – you can bet demand will be excruciatingly high. Don’t wait; order yours now!